I will give some examples to clarify what I mean. 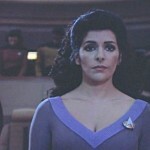 You are Deanna Troi (yes, from Star Trek: The Next Generation—don’t pretend you don’t remember this episode!) and the Enterprise suffers a terrible accident. It is about to explode. For some reason, you’re actually in command of the ship, despite the fact that you don’t wear a proper uniform. Against the advice of Ensign Ro, you decide to stick around to wait and see if someone downstairs fixes the ship before it explodes, even though you have the opportunity to escape. You have no reason to believe that anyone else is alive, but if you leave, there will be no power for anyone to fix the ship and save themselves. Fortunately for everyone, Riker and Data’s head go to engineering and save the day just in time. You are a fan of American football, and on the night of the Superbowl, you make a bet with your friend on who will win the big game. You bet $100 on the underdog, knowing full well that they stand little chance of winning. Fortunately for you, the quarterback for the favoured team falls ill and throws up over the rest of the team. As a result, the entire team spends the next several hours projectile vomiting, and they have to forfeit the game. Your friend admits defeat and pays up the $100. You are drinking heavily, and you get into your car and drive yourself home, despite your friends’ protests and attempts to stop you. Fortunately for everyone, the streets are empty of both people and other cars, and you manage to bring yourself and your car home completely safe. In all of these cases, ex post, you made the right decision—by that, I mean, there was an optimal result, if you consider the decision from the perspective of hindsight. Ex ante, however, in all of these cases, you made the wrong decision. 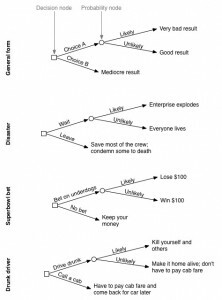 I put these examples in the order that I did because I think that readers will be most sympathetic to the decision in the first example, and least sympathetic to the decision in the last example. 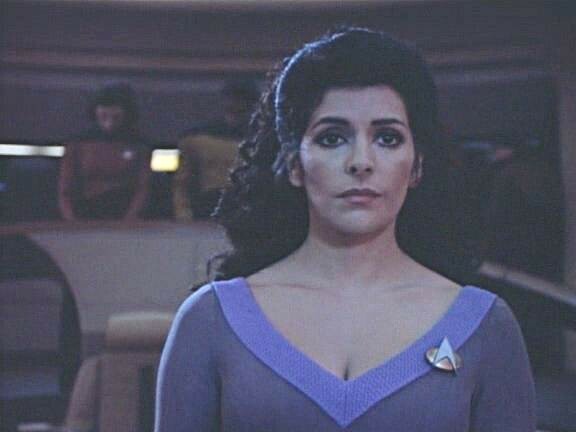 In Disaster, an unreflecting analysis would say that of course Troi made the right decision—it’s the Enterprise, for Pete’s sake! They have to be all right. In Superbowl bet, you might even imagine your friend begrudgingly admitting after the fact that you made the right call (although he might say that it was “just luck,” and for some of us, our intuitions might differ). In Drunk driver, you would be hard-pressed to find anyone who would say that you made the right decision. All of these cases have the same form, which I have diagrammed to the left. You can make one of two decisions—choice A or choice B. If you make choice A, you are likely to experience a very bad result, but there is a small chance that you will experience a good result. 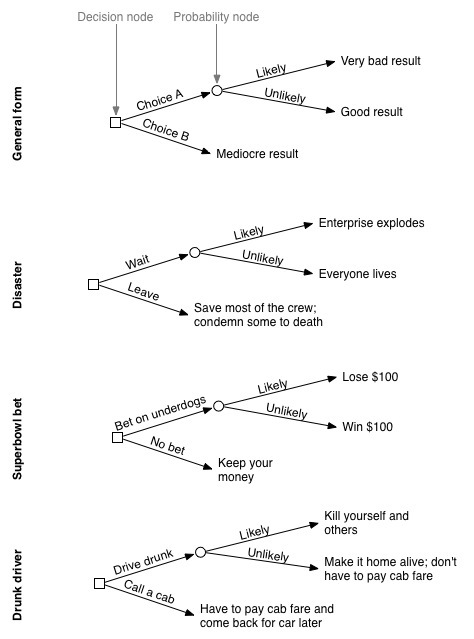 If you make choice B, you are certain to experience a mediocre result (one that has more utility than the very bad result, but less utility than the good result). If all of these scenarios have the same form, we should give the same answer to the question as to what should be done in each situation, on pain of acting irrationally. So even though you won $100 in Superbowl bet, you made the wrong decision. You should have declined to bet. Similarly, even though Troi saved the Enterprise in Disaster, she should have condemned Riker and Data’s head to death. Humans are really bad at judging probabilities and systematically make certain sorts of errors. In particular, humans are easily swayed by trying to place experiences into the context of a narrative. You may have won bets that were long shots in the past, out of sheer luck. In fact, if you are a betting man, likely those are the bets you remember, to the exclusion of the ones with the same odds that you lost. The point is that you shouldn’t model your future decisions after such mistakes. Also, if someone is trying to sway your decisions through an anecdote regarding his or her own success in an endeavour that is unlikely to succeed, it is also irrational to take that as evidence on which to base your decision-making process. If the story includes the line, “and against all odds, everything turned out all right,” or something like it, you should interpret that as meaning, “I made the wrong decision, but I was lucky this time,” and treat it as a cautionary tale. The moral of the story is that you should model your thinking after Ensign Ro, and not after Troi.